It isn't often that I utilize this space for things serious in nature. Rather I prefer to indulge this blog with the lighter slices of life. Yet every now and again diversity strikes a chord in me and I think, "mix it up." It's then I'll notice a certain something that begs to be devoted to. A cause. A gripe. An axe to grind. My axe is quite large today. It's directed at the mean girls and boys out there. You know who you are. You're the ones for whom the crafty and careful hand of karma will one day come calling. You are the bullies that skulk among us. You choose your words and deeds without regard for others. You demean. You taunt. You cause unjust and unspeakable pain. Each day another story of the devastating effects of bullying makes itself known. Sometimes it even hits a bit too close to home. With the ease of access and the convenience of hiding behind a computer screen - online bullying is at an all time high. Young people launch relentless attacks on their contemporaries using the keyboard as their weapon of choice. Even older bullies posing as mature adults with an opinion have been known to wreak havoc. We are a society who thrives on critiquing others. We judge. Often harshly. And we do so publicly and without apology. Our popular television shows not only exemplify this behavior, they glorify it. Is it any wonder the up-and-coming veterans of the grown-up world behave so poorly? I'm here with two simple words of advice. STOP THAT. Bullying Leaves A Scar. It may be old and faint or fresh, new and raw, but either way it's there with you for life. That is why I present the Bloggers BLAST Bullying Campaign. The T is for talking about this dreaded disease. It is only through an open and honest dialogue accompanied with a no-tolerance approach that we will begin to bring bullying to an end. I urge other bloggers to share this post or one of their own on this urgently important topic. Help the victims of bullying to know that they are not alone. They do not need to resort to unimaginable lengths to deal with their grief. We are here. We are your friends. We care. To those mean boys and girls out there - here's a newsflash - we don't care about your excuses. We don't want to hear how you were unloved as a child, or pushed around and now you're returning the favor. One bad turn does not beget another. If it's help dealing with your unresolved aggression you require then seek counseling. But leave those innocent bystanders alone. Or don't. But know this - one day your personal justice will find you. And it will not be lenient. With this post I also pose an open-ended invitation. If you have suffered a scar at the hands, words or actions of a bully and would like to share your story either anonymously or otherwise, my blog is open to you. Always. Simply drop me a note to through my "Contact" page at my website: www.louisecaiola.com In return I will be happy to send you an autographed bookmark as a small token of my esteem. 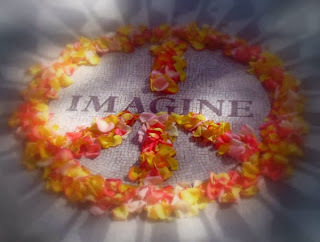 I will close with a song lyric from the late great John Lennon: "Imagine all the people, living life in peace." Well done for publishing this post on bullying. As a mum I have experienced the affects of bullying because 3 of my 4 children have been victims of bullying. It is horrific and parents, teachers etc. need to do more. I'm so sorry to hear about your children having experienced this terrible thing. I hope those bullies have been suitably reprimanded and that your kids are alright. Thanks for commenting.